When God is pleased with a leader's life, his divine presence is unmistakable. 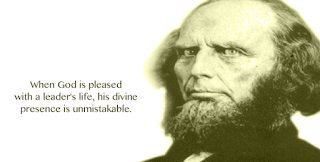 Charles G. Finney was a nineteenth-century evangelist whose life demonstrated the obvious presence of God. During a visit to New York Mills in 1826, he visited a cotton manufacturing plant where his brother-in-law was superintendent. As Finney passed through a spacious room in which many women were working at looms and spinning jennies, he noticed several young women watching him and speaking among themselves. As Finney approached them, they became more agitated. When Finney was about ten feet away, one woman sank to the ground and burst into tears. Soon others were sobbing, overcome with conviction of their sin. This outpouring of the Spirit spread rapidly throughout the building until the entire factory was singularly aware of God's presence. The owner, an unbeliever, realized God was at work and temporarily closed the plant. He asked Finney to preach to his employees and tell them how they might find peace for their souls. Finney had not spoken to any of the laborers. He had simply entered the factory. God's powerful presence in Finney's life had been too overwhelming to ignore.